To ascertain a fitness plan, whatever the target, a consultation is initiated where the client highlights their goals, commitments, restrictions to training through work, family, injuries or illnesses and current eating patterns. With this information, the client and trainer agree a plan.
. Through regular fitness testing and meal planning, both trainer and client are able to ensure that the plan is working and meeting targets within the time frame. The nutritional plans are based around natural organic fresh free range foods. Examples of encouraged foods are meat, fish, eggs, vegetables, fruit, nuts, natural yoghurts, pulses, seeds, herbs, healthy fats and oils. Plans can be prepared for omnivorous, pescatarian, vegetarian or vegan clients. Examples of foods which are to be avoided are all processed foods (added preservatives and sugars), non organic (meats, eggs, dairy) and farmed fish (foods containing pesticides and antibiotics), fruit juices, diet drinks and excessive alcohol . Included in the avoided foods are meal supplements, protein shakes, energy drinks, multi-vitamins and minerals supplements. To ascertain a fitness plan, whatever the target, a consultation is initiated where the client highlights their goals, commitments, restrictions to training through work, family, injuries or illnesses and current eating patterns. With this information, the client and trainer agree a plan. Through regular fitness testing and meal planning, both trainer and client are able to ensure that the plan is working and meeting targets within the time frame. The nutritional plans are based around the paleo diet methodology where natural organic fresh free range foods are encouraged. Examples of food that is encouraged is meat, fish, eggs, vegetables, fruit, nuts, seeds, herbs, healthy fats and oils. Foods which are to be avoided are most dairy products, legumes, processed foods, artificial sweeteners, sucrose sugars, vegetable oils, margarine and grains. Included in the avoided foods are meal supplements and protein shakes. Marielle came to me 18 months ago determined to lose weight for her graduation and live a healthier lifestyle. Marielle had struggled with weight all her life and was entering her final year at university with the additional worry of achieving a good grade. With a detailed training programme that was created around her studies and a healthy weekly meal plan, Marielle lost 33kgs of excess weight in 12 months. In the next 6 months, Marielle’s weight loss slowed down. Her ideal weight for her build and her height meant that she had to lose another 12kgs. The training changed slightly to include more steady state training but continued with a combined weights and circuit session. This was to ensure that we didn’t lose any muscle during the next phase of weight loss. Marielle was put on a calorie controlled highly nutritional healthy natural food programme (plus added calories from calories burnt through exercise) for her ideal weight and in the first 3 months of 2019, she has lost a further 6kgs and is now only 7kgs short of her target. The new target is the correct weight for her height and age and for the first time in her life, she will have a healthy BMI. Rich came to me through a recommendation of another close friend of his and client of mine who was worried about his health. Rich was risking some serious health issues after a health check at the doctors and as he approached his mid forties, with a young family and business to run, was starting to seriously worry about the future of his health and the welfare of his family. 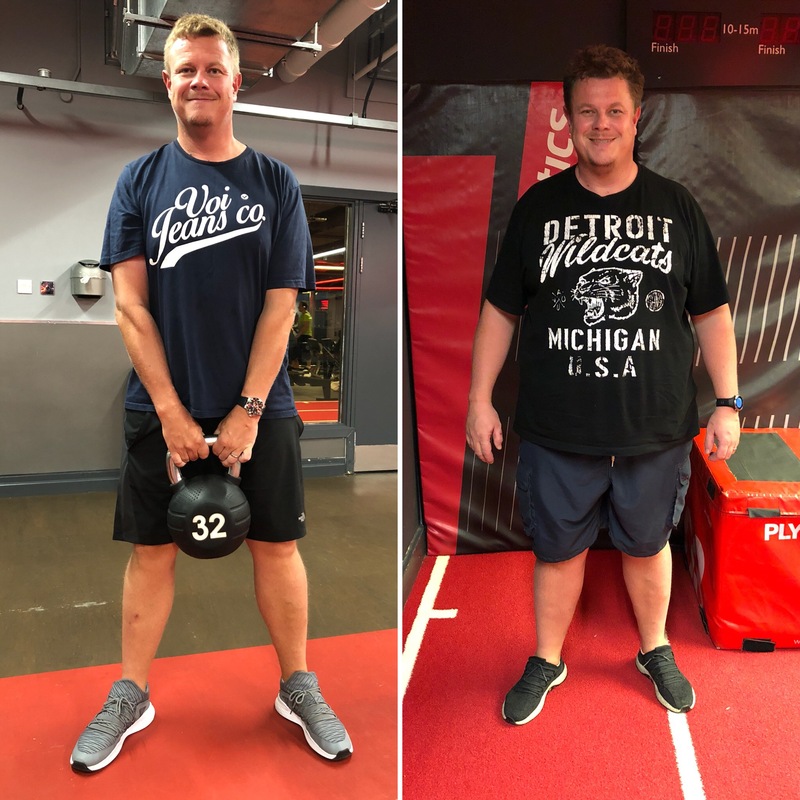 Through carefully planned exercise progressions, steadily lowering his daily calorie allowance to the correct amount for his height, build and activity levels and ensuring he eats a healthy natural diet rich in nutrients and fibre, Rich has shredded an incredible 44kgs in 12 months. He is excited about the future, has more energy and his family are happy and supportive with his new healthy lifestyle. We are truly on the positive health road with Rich and the goal is set to achieve his natural body weight by the end of 2019. David started in the gym last year. He struggled to walk to the gym, was on lots of different medication, overweight and with a pacemaker fitted and was very weak on his legs. I started working on skeletal strengthen exercises and mobility movements to increase his bone density and range of movement. This was the first step in his rehabilitation to a healthy body. The training developed and David changed his diet to incorporate healthy natural foods and eliminating processed sugar from his diet. We worked hard on his core and then developed the cardiovascular fitness through rowing in the gym whilst encouraging David to enjoy country walks at the weekend. 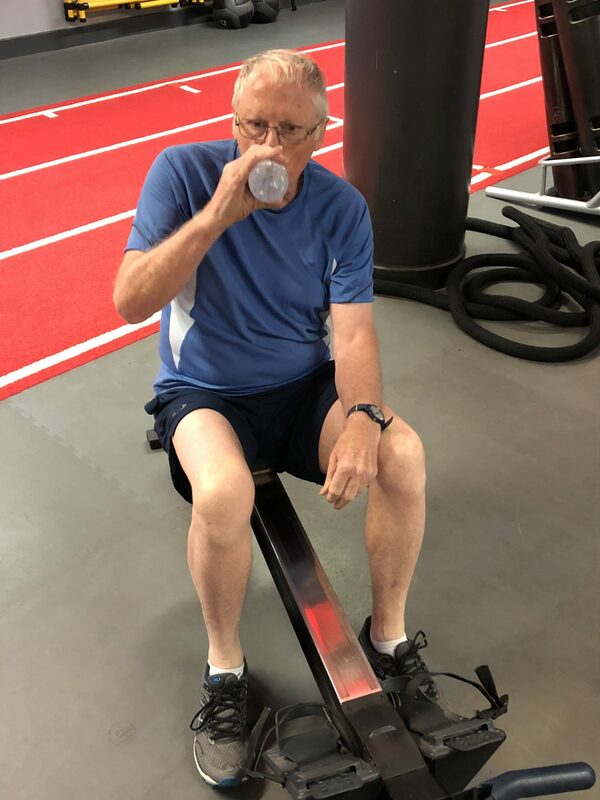 In the past 18 months, David has shifted 28kgs, his doctor has reduced his medication and David has recently improved his 2000 metre time on the rower to 9 mins 24 seconds at 71 years of age, having never rowed before in his life 12 months ago. 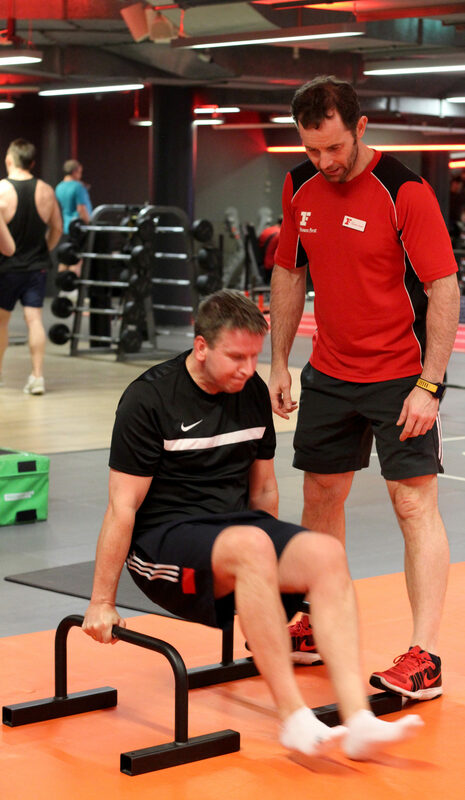 On top of that, David is able to squat, lunge, cycle and lift weights which has all added to his overall well-being, both physically and mentally and is enjoying a new lease of life. Kevin is a doctor who works long hours and drives many hours each day. He is a former American footballer with some very bad injuries resulting from playing the sport without any strength and conditioning training which have resulted in issues with his shoulder, neck, knee and back. Through careful programming of weights, liaising with his physiotherapist and agreeing an achievable course of exercises and training, Kevin improved his range of movements and reduced pain from the shoulder, neck, knee and back. Unfortunately, whilst playing volleyball in October 2018, Kevin snapped his achilles tendon which not only stopped him playing volleyball, but prevented him from working and doing any form of exercise. 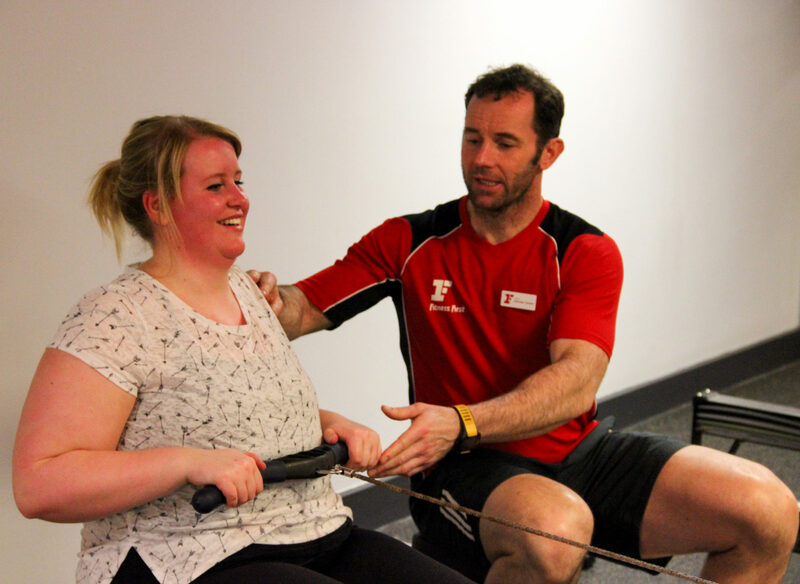 After a suitable period of rest time and building his triceps and shoulders up on cruches, Kevin is back in the gym working on upper body, core strength and flexibility and he is improving his mobility. As a doctor, Kevin is familiar with the length of rehab required and we are carefully introducing limited leg exercises to improve his range of movement (with support of the physiotherapist). Programmed into his rehab will be extended periods of flexibility training and a greater emphasis on strengthen the calves, hamstrings, quadriceps and glutes plus balancing exercises. This type of injury is all too common and is known as the scourge of the mid-life male athlete. It is thought that female achilles tendons are more elastic and that males are 5 times more likely to have an injury. Start your personal training journey today!